Want to learn how to make lotion? You’re in the right place! 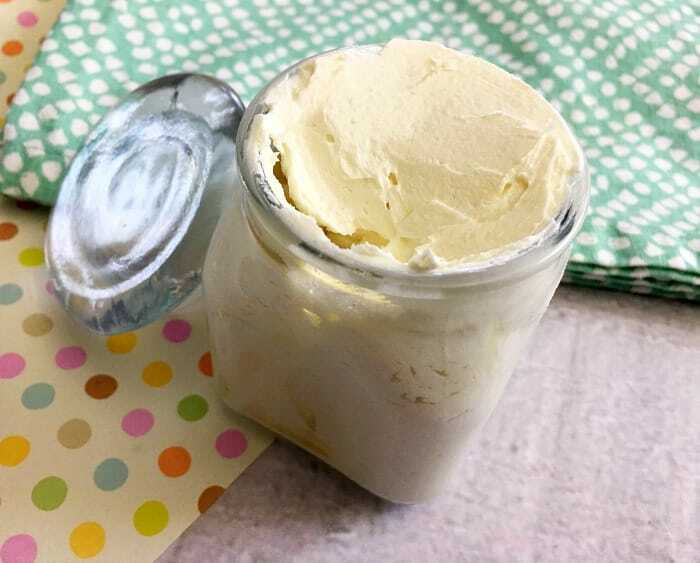 This homemade baby lotion is safe for even the youngest child and most sensitive skin. If you’re a mom (or someone afflicted with sensitive skin) you probably frequently find yourself looking at the ingredient lists on bath and beauty products with a critical eye. Even ingredients that seem to be in everything (for example, fragrance) are suspect. The last thing you want to do is subject your little one or yourself to painful and/or itchy irritated skin. Unfortunately, finding products that are safe can be a challenge. That’s why I try to make many bath and beauty products in my own kitchen, including homemade baby lotion. I know, I know, a lot of people think that learning how to make lotion and other bath and beauty products is just too much of a commitment. However, whipping up natural baby lotion and other homemade beauty products typically isn’t that time consuming or difficult. 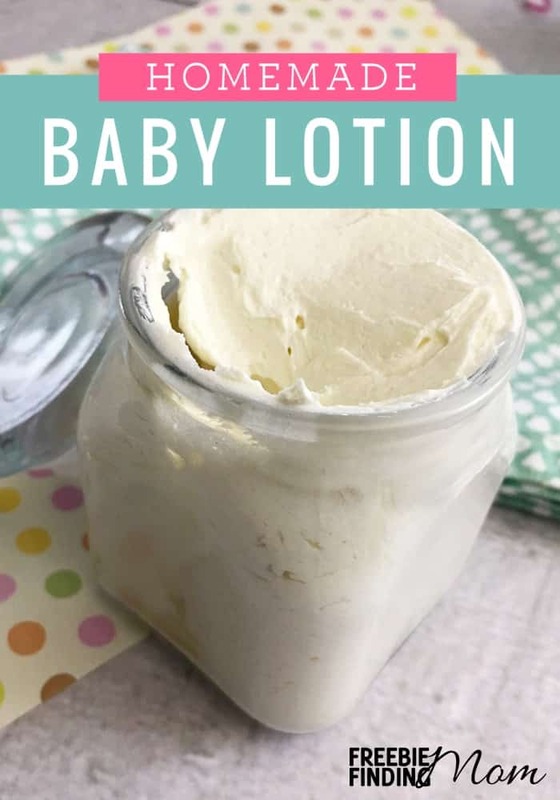 Plus, since this homemade baby lotion is safe for (as the name implies) babies and individuals with sensitive skin, I’m willing to invest a few minutes of my time for a little peace of mind. 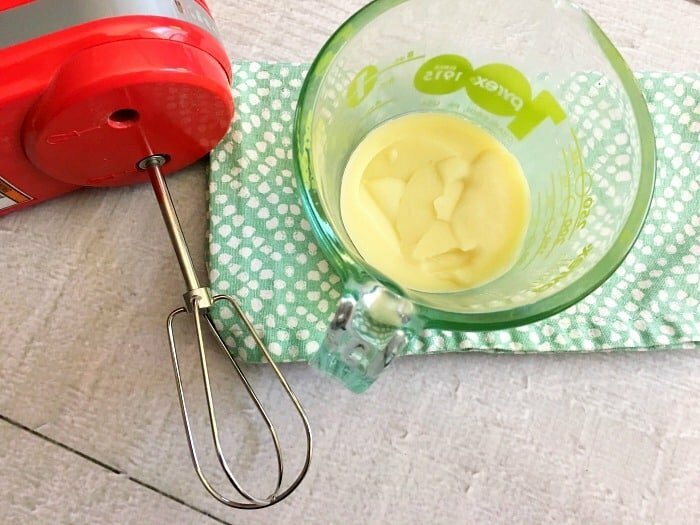 Honestly, you can probably tackle this homemade baby lotion recipe in about 30 minutes, not counting the time the natural baby lotion has to harden in the fridge. Personally, I’d probably spend that much time comparing ingredients at the store and trying to pick the best product! Cocoa butter – When looking into how to make lotion, you can’t go wrong with cocoa butter! Cocoa butter is a natural moisturizer that contains a lot of vitamins including A, B1, B2, B3, C, and E. It contains “cocoa mass polyphenol (CMP), a substance that inhibits the production of the immuno globulin IgE. IgE is known to aggravate symptoms of both dermatitis and eczema,” (Z Living). Coconut oil – I’m a huge fan of coconut oil as it can help with treating acne and wrinkles. Coconut oil is a natural moisturizer that does a great job penetrating skin due to its low molecular weight and because of how it bonds with proteins (draxe.com). The saturated fats in coconut oil help your skin stay hydrated by preventing moisture loss through the pores. To top it off, coconut oil contains vitamin E which plays an important role in skin repair including the prevention of premature aging (ex. wrinkles). Vitamin E oil – This ingredient is a nutrient and an antioxidant that helps neutralize free radicals (which damage cells and can cause premature signs of aging). However, your little one probably isn’t too concerned about that! 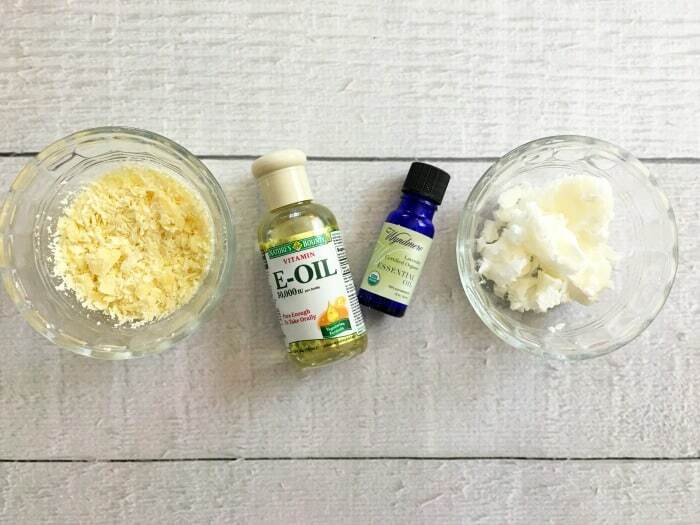 The main reason it’s in this homemade baby lotion recipe is that vitamin E oil forms a barrier between your skin and the environment thereby protecting you from things like sun damage while holding moisture into your skin. Lavender essential oil – This ingredient possesses anti-inflammatory properties to help reduce swelling, redness, and itchiness. In addition, lavender essential oil helps promote relaxation so it may help your little one (or you) catch some much needed Zs. 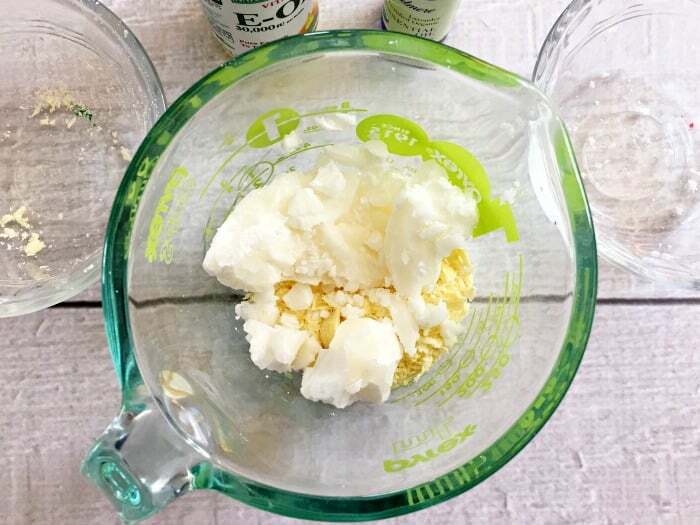 So… do your little one (or your sensitive skin) a big favor and try out this homemade baby lotion recipe today! Note: Use organic ingredients to make this “organic” baby lotion. 1. Place cocoa butter and coconut oil in a glass measuring cup. 2. Place the measuring cup in a small pan and add some water. 3. Bring the water to a boil, stirring the contents of the measuring cup frequently until melted. 5. 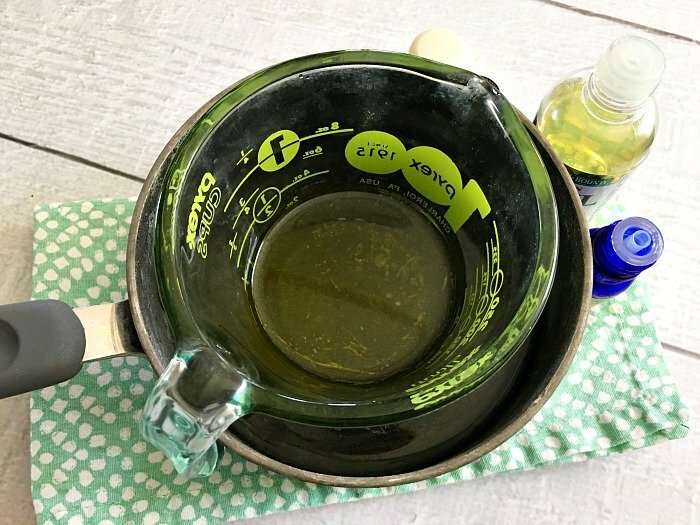 Stir in vitamin E oil and lavender essential oil (optional). 6. Place measuring cup in the fridge until the mixture has hardened. 7. 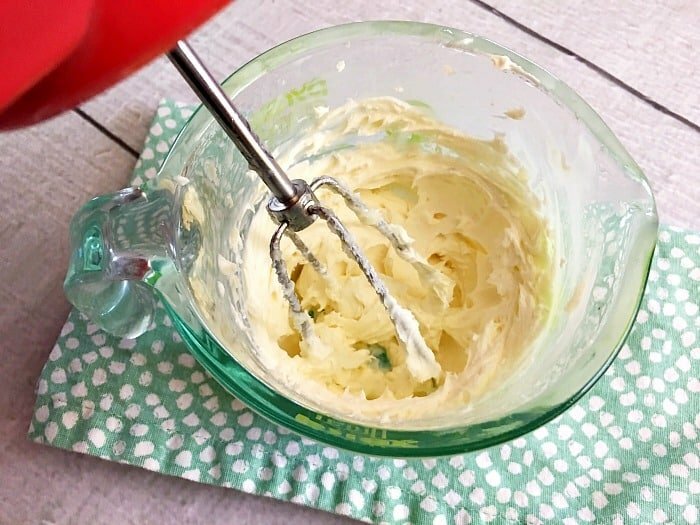 Using a hand mixer with one whisk attached, whip homemade baby lotion until it has a light and fluffy consistency. 8. Scoop into a Mason jar and seal. Tip: If your little one is dealing with chapped lips, try this homemade lip balm to provide relief. To make it safe for kids, just consider leaving out the peppermint essential oil. Can I use Shea butter instead of cocoa butter? How long can this mixture last. And is plastic bottles an option? How long is this good for? Should I keep it refrigerated? Hi Maria, When did it start to harden on you?